The USA Men's U19 World Cup Team stands at attention during the national anthem. Kevin Huerter contributed two points and two rebounds in the victory. Louis King scored nine points and had five rebounds. Austin Wiley, who grabbed 10 boards, shoots for two of his team-high 19 points. Romeo Langford gets ready to drive inside against Germany. PJ Washington goes up for two. USA U19 head coach John Calipari talks to his team during a time out. Brandon McCoy notched eight points and seven boards against Germany. Payton Pritchard heads to the hoop. Immanuel Quickley, who was credited for two steals, tightens up on defense. Carsen Edwards finished with 12 points, four boards and four assists. Cameron Reddish had seven points, six caroms, five assists and three steals. Josh Okogie powers to the hoop. 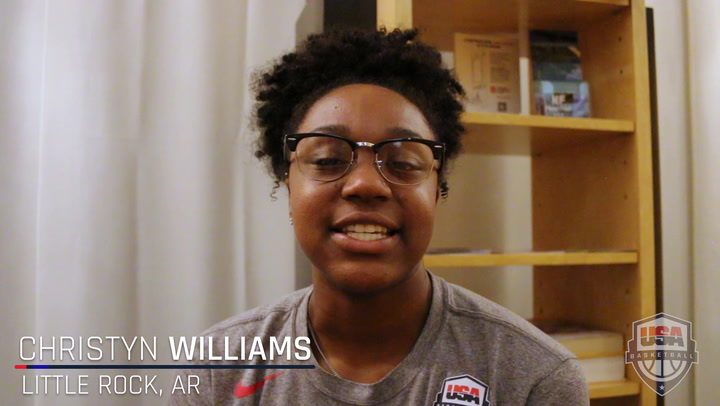 The 2017 USA Women's U19 World Cup Team played Russia in the FIBA U19 World Cup gold medal game on July 30. The 2017 USA Women's U19 World Cup Team's celebration on the medal stand after capturing a silver medal at the FIBA U19 World Cup. The 2017 USA Women's U19 World Cup Team defeated Japan 73-66 in the FIBA U19 World Cup semifinals on July 29. The 2017 USA Women's U19 World Cup Team defeated France 78-51 in the July 28 quarterfinals. The 2017 USA Women's U19 World Cup Team defeated Puerto Rico 104-46 in the July 26 round of 16. The USA lost a hard-fought, gold-medal game 86-82 to Russia on Sunday night in Undine, Italy. The USA Women's U19 World Cup Team will play for gold after defeating Japan 73-66 in the 2017 U19 World Cup semifinals on July 28. Additional quotes from USA U19 World Cup head coach Suzie McConnell-Serio, Crystal Dangerfield, Ruthy Hebard and Megan Walker following the USA's 73-66 victory over Japan in the 2017 U19 World Cup semifinals.